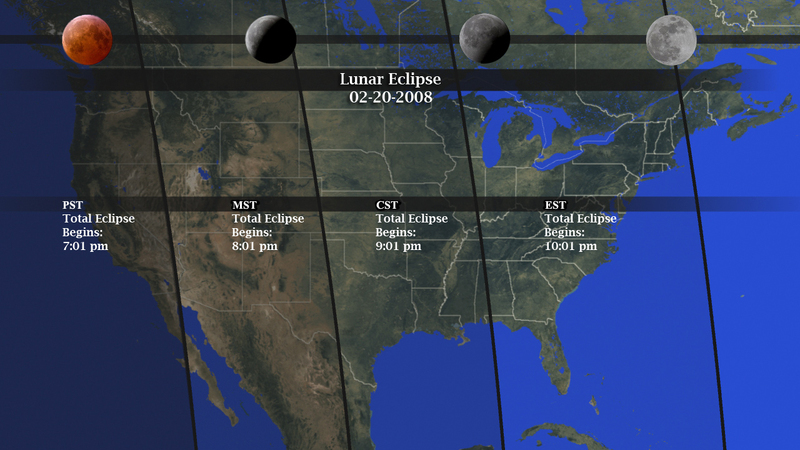 In the late night hours of Feb. 20, 2008, a total lunar eclipse will dazzle the night sky. And this lunar eclipse may be worth staying up for, because it will be the last one until December 2010. A lunar eclipse occurs when the Earth lines up directly between the sun and the moon, casting a shadow over the moon’s surface. The February 20, 2008 eclipse will last for nearly 3 and a half hours. For a full 50 minutes of that time the moon will be in totality – the period when the lunar surface is completely covered by the Earth’s shadow. This map shows when the eclipse will be visible across the United States. Residents of the Americas, Europe and Africa will have the best view of this eclipse. Here in the United States, the entire eclipse will be visible for the majority of the country. However, residents on the West Coast will miss out on watching the early stages of the eclipse, as it begins before moonrise. This Wednesday night, hope for clear skies, try to stay awake and enjoy a spectacular lunar eclipse. The Lunar Eclipse and Full Moon taking place on February 20th also packs a powerful punch in that it sextiles and trines Pluto while emphasizing the limitation represented by Saturn as it triggers an opposition between Saturn and the Uranus/Neptune midpoint. All three outer planets, harbingers of enlightenment and transformation, are therefore activated in these lunations. And indeed the time of transition is upon us. Earth changes that have been building up and largely ignored by the corporate elite representing the old guard have contributed, along with the exhaustion from the war, to the growing sense that the politics of our nation must radically change. It is high time for the lazy denial of self-serving and elitist attitudes to leave and for integrity to step up to the plate. And change must happen within each individual, since each one of us forms the basis as in a hologram of the exciting collective shift that is currently taking place.